For relative hiking novices such as myself, most of our time is spent following well-trodden trails. On pretty much on every expedition, far more capable hikers than I have broken trail and documented their experiences to help those that follow after. Great English language blogs such as Ridgeline Images, Climb Japan and Hiking in Japan, and Japanese sites such as Yamareco are absolutely invaluable in planning expeditions. This is particularly true of the busy trails around Okutama and the Takao area. All, that is, apart from one. 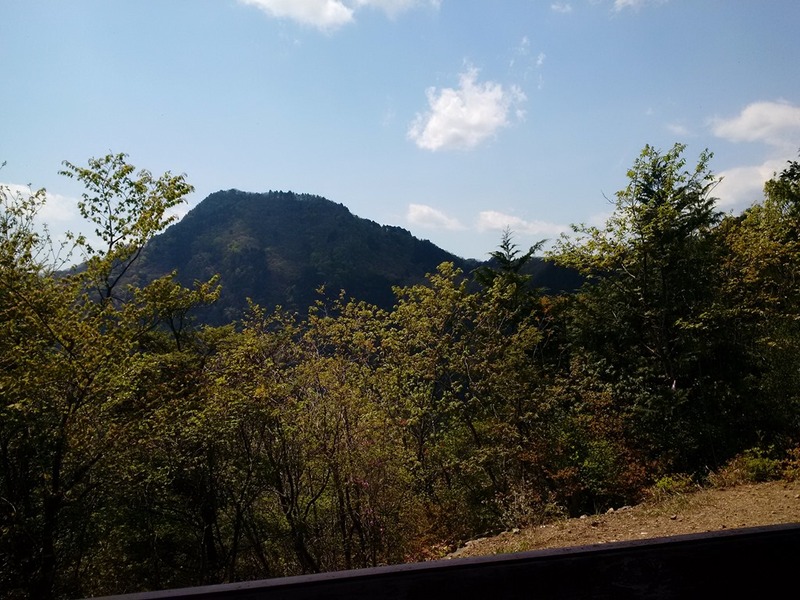 Despite the fact that it adjoins some of the most popular trails in the Okutama region – Mitake to Odake – the Sarugi Ridge trail (サルギ尾根コース) remains curiously undocumented. I had previously eyed this trail on the map as one of the possible escape routes during my near disastrous camping trip of 2014. Thankfully, I discounted it then due to the severity of the slope and approaching darkness. However it stuck in my mind as a trail I should find out more about. 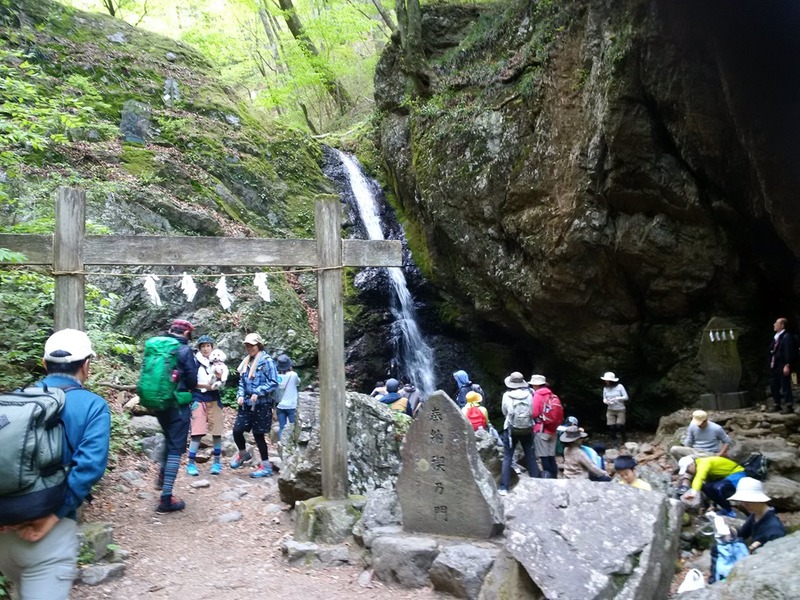 Nice weather at the beginning of Golden Week meant that all of the hills around the more popular hiking destinations would be absolutely swarming with day-trippers. Whilst being desperate to get out, I didn’t relish the prospect of sharing a trail with hundreds of slow-moving plodders. So I started looking for trails that were somewhat off the beaten track. The Sarugi Ridge seemed to fit the bill nicely. My plan was to get to Musashi Itsukaiichi station as early as possible, before taking a local No. 15 bus towards Kamiyouzawa (上養沢 ), alighting at Odakeshounyudou iriguchi (大岳鍾乳洞入口) and the trailhead. From there, I’d head NW, climbing steeply to the Sarugi ridgeline, heading towards the peaks of Takaiwayama 高岩山 and Kamitakaiwayama 上高岩山. After passing the observation platform at Kamitakaiwayama, it was a straight trail to link up to the trail between Mitake and Odakesan. I then planned to drop down into the famous Rock Garden – a stunning limestone gorge with spectacularly waterfall and fast-flowing mountain stream – and trek along that valley until I arrived at Mitake. In total, the trail was 7.6km with an overall elevation gain of 1013m. On the day of the hike, I rose bleary-eyed at 5am to get my kit together and catch the early train. Things took an unwelcome turn when a casual venting of nocturnal wind revealed the presence of an unexpected non-gaseous component. Several trips to the smallest room later, it was clear that things were not at all right downstairs. Yet, despite the warning rumbles of more fun to come, I decided to press on with my plans. The journey to the trailhead took somewhat longer than anticipated due to several unscheduled stops to visit the facilities en route. Having missed my planned bus, I arrived at the trailhead about an hour later than anticipated but with plenty of time in hand, this was not a problem. After what I hoped would be the final rest-room stop that morning – in an amusing WC disguised as a tree – I broke out the hiking pole and got ready to tackle the first part of the climb. The Sarugi Ridge trail begins – as do so many trails in the mountains – behind a picturesque Jinja, in this case Odakesawa Jinja. It was clear from the outset that this was going to be a challenging trail. The first 1.5km takes you from 360m to 708m, straight up the side of a steeply wooded, muddy hillside. Hand rails have been installed at the lower reaches of the first section, but these quickly peter out and it becomes a hands-and-feet scramble over tree roots as you climb towards the ridge. The deciduous woodland on the lower slopes means that leaf litter is a potential hazard, particularly when descending the steep slope. At about 1km in, the trail levels off briefly as it picks its way through the cedar, before turning skywards once more for another lung-bursting ascent. At this point, the trail changes character slightly as the rocky back bone of the ridge begins to show itself through the forest loam. After another 50m of plateau, the trail turns once again steeply upwards as you begin the climb up to the ridgeline proper. According to Garmin, some sections of this climb have a gradient of over 70%, which is a steep scramble. As a climb, it certainly felt demanding, but not overly so. I would put the level of difficulty to be about the same or possibly slightly more than some of the challenging sections of the ascent to Gozenyama from the Lake Okutama side. Coming down this slope, though, would be a different matter. 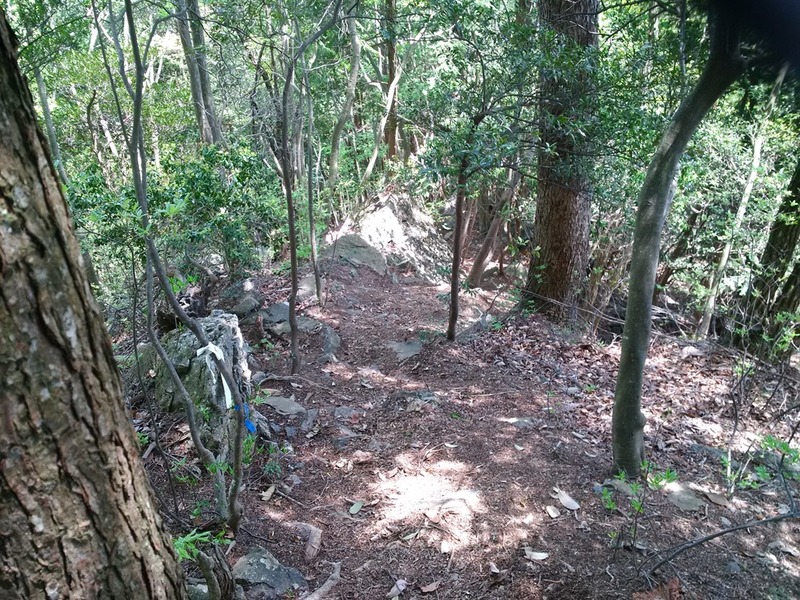 Unlike the trail at Gozenyama, there are no ropes or chains on this section and a lot of the time you’re on a treacherous mixture of loose earth, rocks and dry leaves. Once again, I said a silent prayer of thanks for my decision not to try and tackle this in the dark on my previous foray to this area. The trail climbs higher, covering more rocky outcrops and short scrambles. For the most part the trail is fairly evident, but it tends to disappear on the rocky sections, requiring you to pause and assess each short section to make sure you are not following a blind alley. As the trail attains the ridge it features some quite steep drop-offs on both sides. As it passes over some of the rockier outcrops, some care is needed to place your footing securely. One other notable feature of this trail soon became apparent – it was completely deserted! On a sunny Saturday morning at the start of Golden Week, I had expected to see at least a couple of other hikers. The freshly-written bear warning sign hung over the signpost at the trailhead made me a little nervous . This is the time of year when bears emerge with their cubs. Bear mums are fiercely protective of their offspring. Encountering a family group on a narrow ridge trail would be awkward to say the least, so I made sure I was making plenty of noise as I was going along to alert any bears to my presence. But for now, my only companions in the green spring woodland were woodpeckers, Japanese bush warblers and benign kumabachi bees. The solitude allowed me to just focus on climbing and experiencing the environment, and I was thankful for that. The trail continued to edge across numerous small rocky outcrops. In a couple of places, the trail presents some challenges. Apart from the short handrails at the trailhead, there are no man-made aids on the ridge trail. Every challenge you face, you must face alone. One particularly entertaining section is where the trail crosses a minor peak, but slams headfirst into a solid boulder blocking the way, with steep drops on both sides. It looks like in the past the trail edged around to the right, offering a few centimetres tread over quite a steep drop. But a tree has grown from the slim ribbon of soil, effectively closing that off as an option. The only way is to clamber to the top of the boulder and slide yourself down the other side, aiming for the metre of flat trail atop the very narrow ridge. It sounds daunting but it was far more fun than scary. After attaining the peak of Takaiwayama any thoughts of a benign stroll atop the ridge to the next waypoint are quickly dashed. I’d noted on the map that there was a building on the summit of the final peak, and from here it was clearly visible. Between me and it lay a substantial valley – a far bigger obstacle than noted on the map. A steep descent to the bottom is followed by an equally steep climb. But the knowledge that this is the last big climb makes it a little easier. From above me, I could hear the sound of voices. As I emerged from the trees at the top of the slope, I discovered a built observation platform, filled with a hiking party enjoying their lunch and the stunning views. From here I had a clear view of Odakesan, and a little further over Mitake village was visible through the trees. Turning clockwise, there was Hinode yama and a clear view beyond towards Tokyo. I think of all the views around Odakesan and Mitake, this is by far the best. I had originally planned to stop for lunch a little further along. But it was already 12.30, and this was an agreeable enough spot so I thought I might as well stop here. I wasn’t feeling particularly hungry anyway as my stomach was quite uncomfortable and I didn’t feel that great. Nevertheless, I jammed down an onigiri and small but unappetising pot of cup rice, washed down with coffee. Within 30 minutes I was on my way again. The large group of hikers were also giving signs of imminent departure, so I wanted to get myself on the trail ahead of them to avoid being caught in a traffic jam. However just a few minutes after leaving the shelter, I felt a sudden stomach cramp and I knew I wasn’t going to make the next WC, situated at the top of the Rock Garden valley. I now had a bit of a problem; ridge trails don’t offer many opportunities to dive off into the undergrowth. So I had no choice than to grit my teeth and push on. Shortly thereafter, however, the trail opened out giving some scope for privacy. I was mindful that there was a group of 20 hikers hot on my tail…would I have time before they arrived? I listened for the sound of bear bells, but all was quiet so I decided to go for it. Garmin faithfully recorded my frantic search for a suitable landing location. A small outcrop provided a sparse bit of cover, so pack and cacks were swiftly dropped. However in my haste, I had not spotted a small sapling poking up through the leave litter, which ended up inserting itself into quite an uncomfortable place as I took position, causing me to rise involuntarily – my yelp of surprise quickly suppressed by catching sight of the lead group of the following party that had unexpectedly appeared, ninja-like, from around a bend. I quickly ducked down and hoped that I hadn’t been spotted. But luckily, I appeared to have remained undiscovered. Feeling better, and trying not to giggle uncontrollably, I geared-up and headed out once more. Within a short time, I spotted the familiar junction on the Mitake-Odakesan trail, and with it, the crowds of day trippers. A little while back, I’d seen a sign for the Sarugi Ridge trail, but alongside it was a yellow sign warning of the falling hazards beyond. That pretty much explained why the trail past the observation platform had been deserted. But interestingly, no particular hazards were noted on the various maps I had consulted. Once again, this illustrated to me the variable reliability of Japanese maps. It really does pay to cross reference several maps when planning a hike, in particular the excellent Geological Survey maps available online or in most bookstores. The rest of the hike was pretty uneventful. The Rock Garden and all the trails around Mitake were packed with day trippers, which made for fairly slow going. But it was a pleasant coda to the day’s activities. Apart from the unfortunate bowel problems, this had been a great little hike. It also provided clues to some further challenging hikes in the area. I discovered another little-used trail that connects the Rock Garden to the Sarugi Ridge. One for another day. 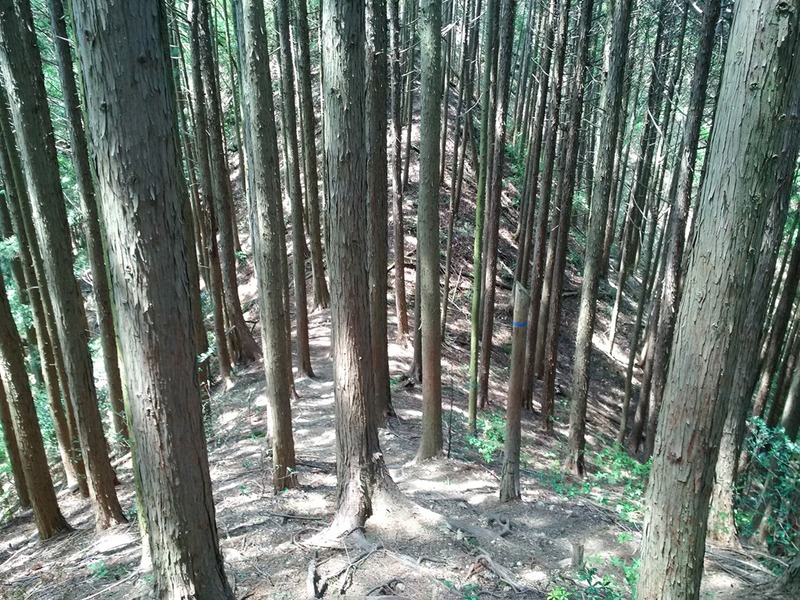 As for my impressions of the Sarugi Ridge Course, it’s a great little trail that offers peace and quiet, even on the busiest of weekends, and is challenging enough to make attaining the summit of Kamitakaiwayama feel worthwhile. 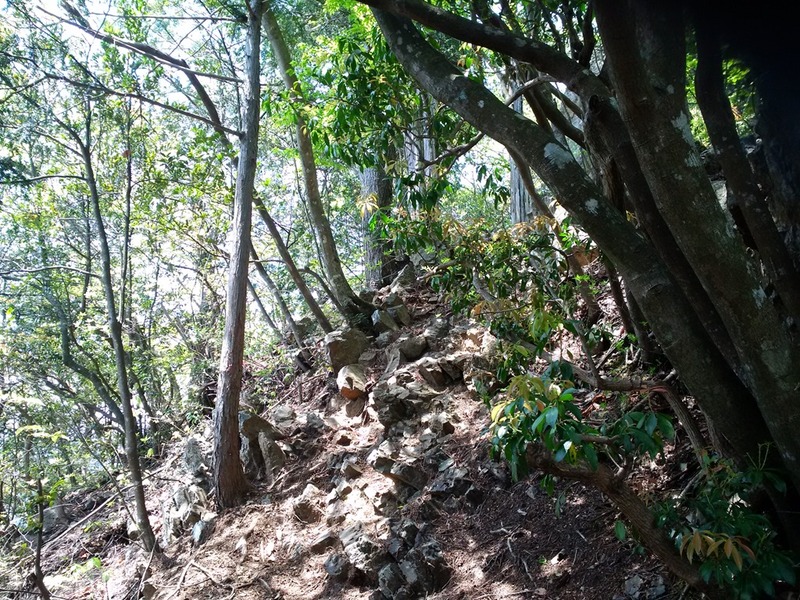 The views from the observation post are outstanding, and this part of the trail is easily accessible from the Mitake end. On the negative side, going down towards Kamiyouzawa could prove a difficult route, especially in wet weather and I can see why warning signs are posted at the start of the Sarugi Ridge. There are no safety aids such as chains or ropes, and the trail is very steep in places. Perhaps one for more experienced hikers. And definitely those not experiencing digestive issues!